Why would you want to drink goats milk? Milk’s just milk isn’t it ? At first appearance, it would appear there are no great differences between the milk of different animals . From the graph below you can see that the fat, water and protein content of human, cow or goat milk are roughly the same. So, what is the use of drinking goats milk, when it would seem to be similar to cows milk? There are several important major differences. The protein in cows milk is different one to the protein in goats milk. This means that people who have a cow milk protein allergy can often drink goats milk with no ill effects. While there is no difference between the lactose composition of cow and goat milk, it may be worth giving goats milk a try as some lactose intolerant people say they can drink goats milk, whilst other report that it makes no difference. The presence of diseases such as Brucellosis and Tuberculosis in dairy cattle in the early 1900’s, lead to the pasteurisation of cows milk to protect people from contracting these diseases. Before the days of pasteurisation , goats milk was often consumed in the belief if was “healthier”. As it turned out this piece of folklore had good foundations, as the diseases brucellosis and tuberculosis have never been known in goats in Australia. For this reason the sale of raw goats milk in some states and territories of Australia is permitted under special permit. The choice of drinking raw or pasteurised milk is entirely a personal one. Some people feel pasteurisation offers added safety through the lowering of bacteria numbers. Others realize pasteurisation does not discriminate between bad bacteria and the good bacteria that can be beneficial to our bodies. Who are the people most likely to benefit from goats milk ? Infants who suffer from colic, asthma, excma may well be worth trying on goats milk. If a cow milk allergy is suspected or diagnosed, do not forget to remove all sources of cows milk from the diet (including ice cream, cheese, chocolate etc) and substitute goats milk and goat milk products. People with digestive conditions often try goats milk as its naturally homogenized form and ability to form a soft curd can aid in digestion. 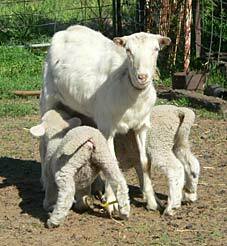 For more than a century goats milk has been known as the “universal foster milk”. It can successfully be used to raise a large variety of baby animals including puppies, kittens, lambs, calves, foals, deer fawns and donkey foals. For many years people successfully used goats milk for raising baby kangaroos and wallabies. No wonder the female goat has long been referred to as “nanny”!